QUS Pty Ltd has been recognised as an Employer of Choice in The Australian Business Awards 2017. 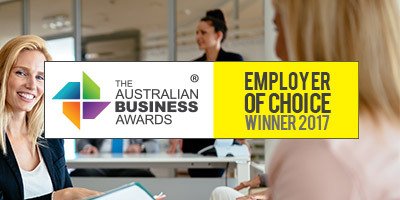 The Australian Business Award for Employer of Choice [EOC] recognises organisations which have developed leading workplaces that maximise the full potential of their workforce through practices that demonstrate effective employee recruitment, engagement and retention. Organisational participation into the Employer of Choice Awards includes private companies, publicly listed companies, multinational subsidiaries, not-for-profit organisations, non-government organisations, educational institutions, franchise systems, partnerships, government departments, government agencies, local government and statutory bodies operating in Australia. Employers of Choice are required to demonstrate their achievements the across the key areas of Organisational Culture & Leadership; Employee Education, Training & Development; Employee Health, Safety & Satisfaction; Performance Management; Recognition & Remuneration. Entries are assessed utilising a rigorous and dynamic framework to ensure that the assessment process is pertinent and objective. The Employer of Choice Framework (EOC Framework) is a structured model of assessment that consists of specialised assessment criteria and sub-criteria that provide a robust set of requirements that are used as the methodology for benchmarking and learning among the participating organisations. The key attributes of the EOC Framework outline the characteristics of well-managed, high-performing, industry leading organisations that provide a stimulating and supportive workplace.